The common belief is that Washington State is known for apples, hops and onions. The wines of Washington State don’t even make a blip on the radar. People hear Columbia Valley and they immediately think we’re talking about Oregon. Wines from the northwest are not just Oregon wines. Washington wines are just as important. Over the next 3 months you will see a big push for Washington wines in San Diego. The Washington Wine Commission, a state government-run agency intended to promote awareness of Washington’s viticulture and enology is campaigning in San Diego. They are promoting Washington Wines via all media outlets. 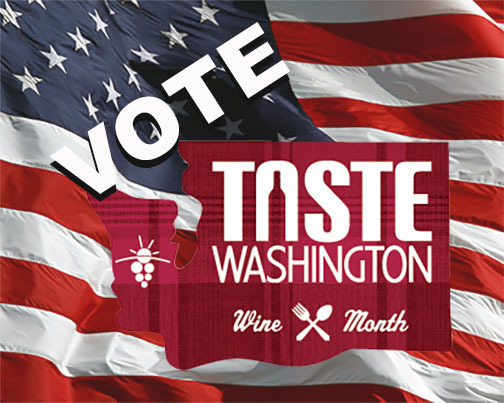 So if you are tired of presidential campaigns, grab a glass and vote for Washington State wines. I have partnered with the commission to help promote the wines of Washington. Think of me as a grassroots campaign manager. Why Washington wines you ask? Washington wines are some of the most interesting wines. The region is very large with varied micro climates and soil types. Most people’s image of Washington State is rain and more rain. This is not the case in the wine growing areas. Washington State is a desert protected from rain by the Cascade mountains. The mountains create a rain shadow effect which leaves sun and more sun to shine over the valley. However, the mountains and the many rivers provide cooling which is ideal for grape growing. The winds blowing in from Idaho bounce off the Cascades and come swooshing across the valley helping the vines fight pests and disease. I have spoken about Washington wines in the past, but this time I really want to talk about is what makes them so different. It is all about their soils. Millions of years ago ice glaciers melted and came rushing down from the Great Lakes through Washington State, an event known as the Missoula Floods. With them they brought rocks and sediments spreading them throughout the valley. These deposits left in the soils are the key to great grape growing in Washington. The winds also brought sand and silt which is constantly blowing in the valley. This soil structure allows for plantings of unique vineyards to show terroir and identity. The wines from a small vineyard in Walla Walla “the Rocks” is so unique that in a blind tasting the Syrahs can easily be picked out. Talking about blind tastings, several years ago the moment of truth hit me. I was in Washington with 30 + other sommeliers and wine professionals blind tasting some of the highest rated wines in the world. We had Pahlmeyer, Caymus Special Select, Mouton, Clos Apalta and a few Washington wines such as Abeja and Cote Bonneville. We tasted Syrahs, Merlots and Bordeaux blends from around the world. Most of us picked the wines of Washington State as the superior wines. This event won my heart over and since then I have become a promoter of the wines of Washington. I am so happy to be on this campaign. March is Taste Washington Wine Month. I am going to do everything in my power to spread the word and turn the good folks of San Diego to the overlooked region of Washington. All month-long, the Cohn Restaurant Group will feature wines from Washington at specially selected restaurants. We start the month on March 12th at Sea 180 Coastal Tavern where I will host a symposium and wine tasting with winemakers, winery owners, salespeople and the Washington Wine Commission. We will host wine dinners and lunches at Island Prime, 333 Pacific and Vintana. Bluepoint will run specials all month and host the winners from a local radio show’s contest for dinner. So much is happening, I hope you are part of the campaign. And don’t forget to vote WASHINGTON.